Orlando shooting: We need to do more than send thoughts and prayers. Orlando: What Can You Do in the Face of Another Senseless Gun Tragedy? By now you’ve heard the story, read the articles, perhaps even listened to the president, sounding tired and at a loss after having to make a variant of this speech more than a dozen times since talking office. There have been a lot of updates since that morning, and there will be more to come. Twitter was its usual self, both an excellent and abhorrent example of the good and the awful in humanity. I don’t usually comment very much in social media about such things, mostly because it tends to erase subtlety and flatten layers of meaning. But like so many others, I couldn’t stand by, silent. So I composed a series of thoughts and laid them out on Twitter and Facebook. Waking up to another mass shooting, another mass murder, in my country. More than 50 gay people dead, their crime being who they were. Appalled. Saddened. Sickened. Angry. But not shocked. When fear, loathing, and disgust against entire groups of people are officially sponsored by the State, how can we be shocked? “It’s too soon to politicize a tragedy”. Bull. It’s too late. It’s always too late. People are dying because this has always been political. Senseless anti-LGBTQ laws have been cynically used this whole election cycle for one reason: Promote fear. By this I mean the ridiculous transgender bathroom laws that are getting so much airtime (and which, incidentally, are unconstitutional). Given that there’s never been a recorded case of a transgender person attacking a child in a public restroom, the purpose behind these laws, so heavily promoted by state-level GOP politicians, is obvious: scare people, and get them to the voting booths come November. And many politicians send their “thoughts and prayers”, but refuse to even discuss any action on guns. Of course people want to send their thoughts and express their grief; that’s natural and very human. But it’s cynically hypocritical when politicians do it and nothing else. Congress made it extremely difficult for the Centers for Disease Control and Prevention to even study the effects of gun violence. Seeing all the NRA-funded lawmakers tweeting their “thoughts and prayers” was particularly galling. I know there’s no easy answer to this. But I also know *no* answer will found by doing nothing, allowing no research, taking no action. 20 children were killed in a school and no action was taken. A US Representative was shot in the head and no action was taken. We have an election coming up soon. I’m asking you to take action. Vote. Take special note of how politicians reacted after the shooting. Watch President Obama’s calm speech again. Note how he calls this event a shooting and specifically mentions the LGBTQ community. Contrast that with Donald Trump’s response, who made a series of appalling tweets about the event, then released an unhinged statement about “radical Islam,” saying Obama should step down, and then gave an interview on Fox strongly implying conspiracy ideations about the president. Contrast that with Hillary Clinton’s response, which was far more measured and reality-based. She understood that information was (and is) still lacking, and going off like tainted batch of fireworks not only is the wrong thing to do, but it actually makes things worse. As my Slate colleague William Saletan wrote in the link above, hate against Muslims is what ISIS wants. And also note that, like the president but unlike Trump, Clinton didn’t hesitate to talk about guns in her reaction. She addressed the actual situation, not some fantasy spun out of conspiracies and hatred. Also, if you want to donate money to help, Equality Florida, the state’s (LGBTQ) civil rights organization, has set up donation page on GoFundMe. They also have information there about other ways to help. Not long after I posted those tweets, my friends at STARtorialist posted the image of a heart I used at the top of this article, and it really struck me, so I retweeted it. 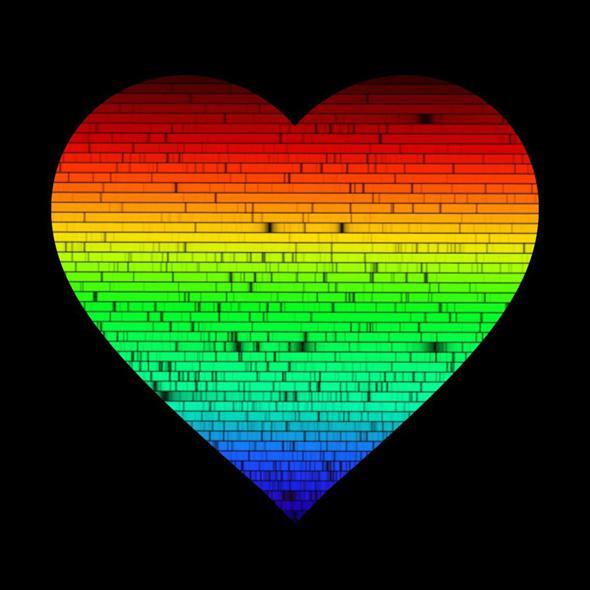 Inside the heart is the spectrum of the Sun, composed of light from all of its constituents inside it and mixed together, shining down on Earth. If there’s a metaphor there, feel free to ponder it. *Update, June 13, 2016: This post has been updated to more accurately reflect the death toll from Sunday’s shooting. Earlier reports of 50 victims included the shooter, but it’s standard practice not to list the perpetrator as a victim in these situations.